« Do You Sparkle? Will You Sparkle in Freeport? White Christmas? How About A White Halloween? When we were children it seemed people always wondered whether or not we would have a white Christmas. That is, would there be snow on the ground by Christmas Day. We can’t answer that on (though we could hazard a guess…), but this year we had snow before Halloween. By late morning some of the snow had begun to melt. By Saturday evening (October 29) the storm that had formed over the southern Atlantic coast had moved north, dropping snow on Washington, D.C., and several other locations from New Jersey to Connecticut. 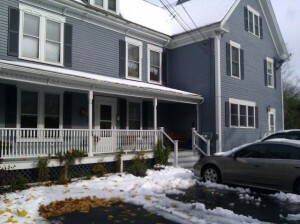 It went up the east coast of the US, then the winds backed up onto northern New England, forming a classic nor’easter. The storm began to drop big, soft, white, flakes on Freeport about 7:00 p.m.
We awoke in the middle of the night to find the heavy weight of the snow had knocked the power out, and began planning for a breakfast that could be prepared without electricity. Our stove is gas (propane, actually), so we quickly changed the planned breakfast of a baked egg dish and scones (that needed to be baked in the morning) to Ruth’s special scrambled eggs with bacon, roasted potatoes, and muffins – all of which could be prepared on top of the stove. The next challenge was the coffee. Since we use French presses the only requirements were boiling water and grinding the beans. The water was easy, since we could boil it on the stovetop, but the electric grinder wasn’t going to work. We double-bagged some beans, and smashed them with a rubber mallet, to get them as finely “ground” as we could, and served up fresh coffee – just not quite the “usual” strength. The guests were all delightful about their “adventure” and ate breakfast by candlelight. Two couples decided to sleep in, just appearing for a cup of coffee, while the others enjoyed the sense of camaraderie that comes from shared difficulty. Just as the last guests were finishing their breakfast, the lights flickered, then stayed on. We all breathed a sigh of relief, as the power was back, hot showers awaited, and a good time was had by all (wasn’t it? ).